The digipack version includes the bonus tracks Thunder In The Dark and Heart Of The Black (Edit version). Paragon's previous album Force Of Destruction (2012) was a major success, somewhat of a minor comeback album some might say, and when they during the pre-talk for this album said things like that they thought they had taken things in a different direction and were going to try out some as of yet unexplored paths, I became a bit suspicious. 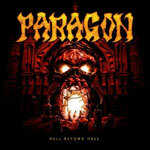 My fears showed to be totally ungrounded, however, since this is indeed classic and familiar Paragon as we know and love them, and this album goes right in to the top area of their entire catalogue in my ears. The tempo is intense all along until the closing semi-ballad but the focus is as always on the riffs and choruses, and this time around especially the latter. It is massive and thunderous and one of their heaviest album so far, close to being on par with the phenomenal crusher Force Of Destruction, and filled to the brim with catchy riffs, hooks and choruses. The only parts on the album that don't work out especially good is the chorus in Stand Your Ground and the first half of the closing song, but apart from that it is a straight through great album. Paragon is riding on a career peak at the moment. I sincerely hope for much more of this to come.